During the summer months, we’re profiling the four state parks near Asheville, NC, as part of Inn on Mill Creek’s nod to the 100th birthday of the North Carolina State Park System in 2016. 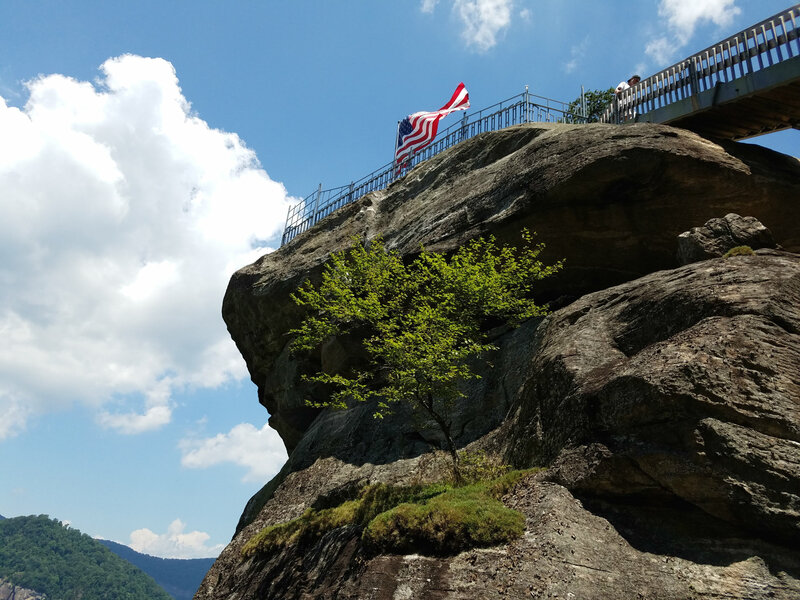 Our July feature is Chimney Rock State Park and its iconic 315-foot granite namesake. 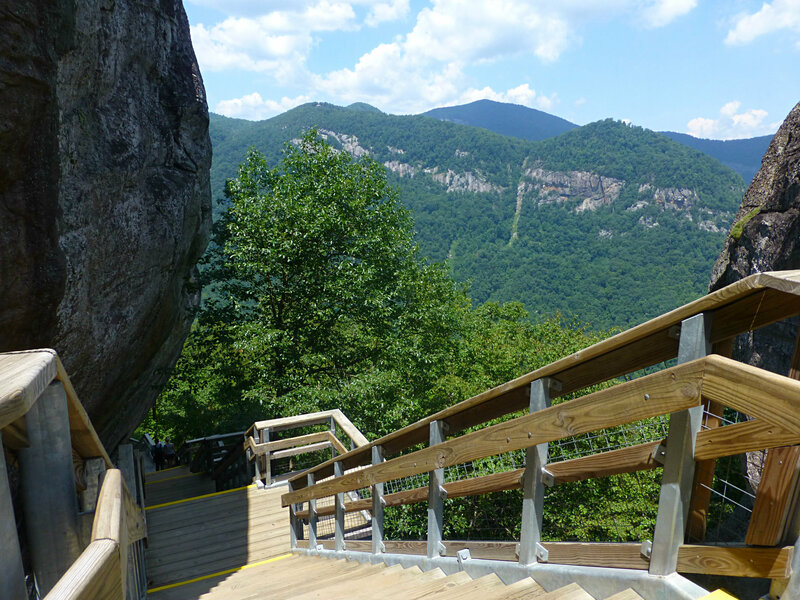 Currently, the way to get to the top of Chimney Rock is a set of 499 steps. So…up, up, up, we go. Let’s do this. The Outcroppings Trail…wear comfortable shoes, bring water, and then prepare for a rewarding workout! 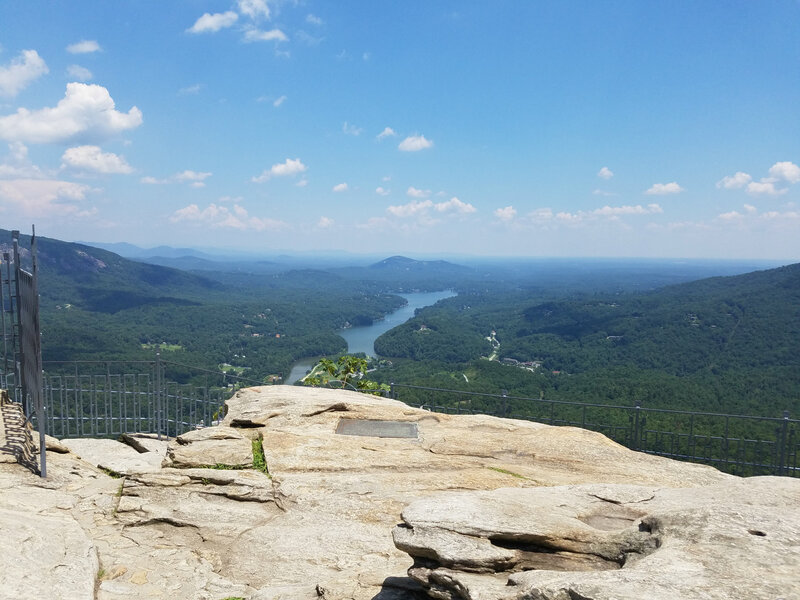 But first…let’s get to know this beautiful state park a little better: In 1902, Dr. Lucius B. Morse purchased 64 acres, including Chimney Rock, with financial assistance from his two older brothers. In the early 1900s, the entire mountains region was known for its healthful climate, attracting many who were suffering various ailments. Visitors often ended up being so enchanted by the area that they stayed. Dr. Morse, who was suffering from tuberculosis, was one of those people. 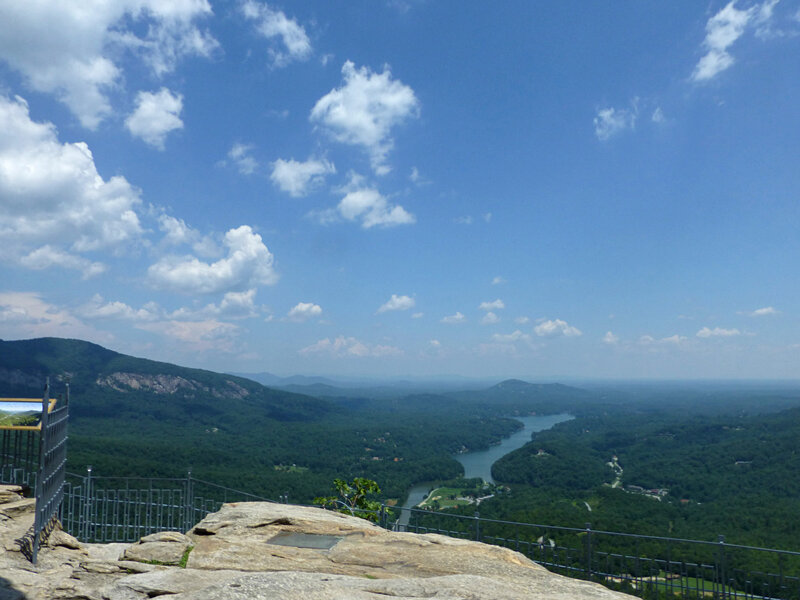 Dr. Morse got the idea of creating a public park while admiring the view atop Chimney Rock. Back then, the way to the top was by riding on a donkey. After purchasing Chimney Rock and the land around it from a gentleman named Jerome Freeman, Dr. Morse and his brothers had a three-mile road constructed to the base of the chimney, and trips to the top by donkey were replaced by stairs. Dr. Morse passed away in 1946, but improvements continued under the leadership of his brothers, and in 1949, an elevator was installed inside the rock. Over the years, members of the Morse family continued their work as stewards of the now 996-acre Chimney Rock Park, installing trails and scenic overlooks, renovating buildings, adding guided hikes and educational programs led by botanists and ornithologists and building a Nature Center. The park even became a bit of a celebrity in the early 1990s when parts of the movie Last of the Mohicans was filmed there. By the early 2000s, a handful of conservancy groups were busy acquiring land in the Hickory Nut Gorge around Chimney Rock Park, in anticipation of creating a new North Carolina state park. 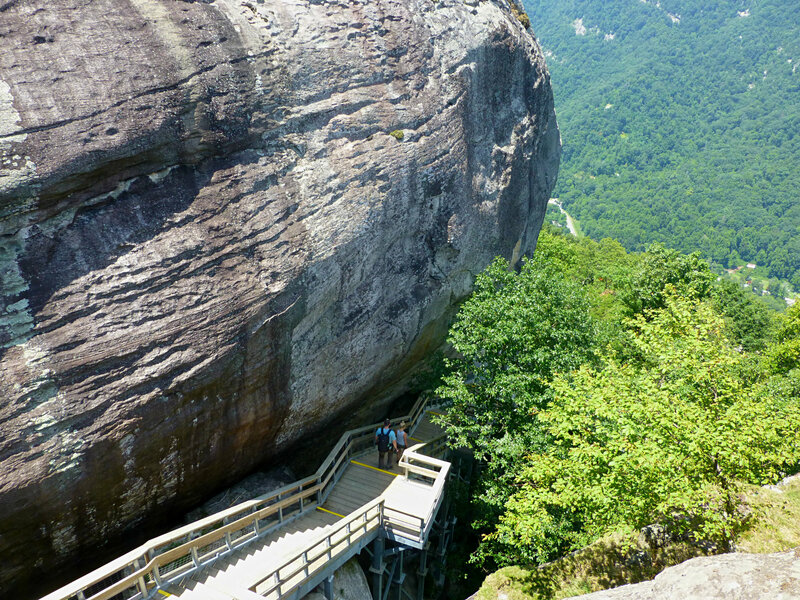 The Morse family began negotiations with the State of North Carolina to make Chimney Rock Park part of the state park system in 2004. After some bumps in the road, everything worked out and the Morse family sold Chimney Rock Park to the state in 2007. Chimney Rock State Park is now more than 6,800 acres and growing as efforts continue to protect additional land and wildlife around the park. 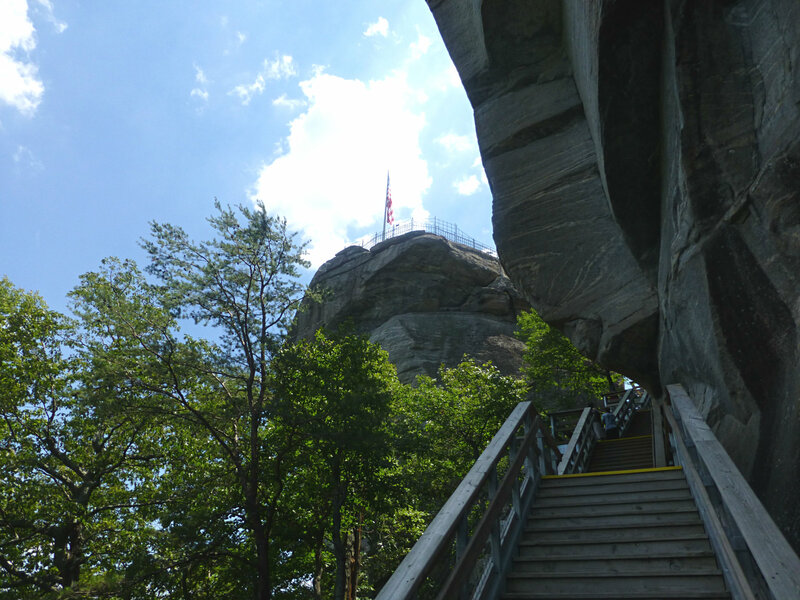 But no matter how big it gets, the park will always have at its heart the landmark known as Chimney Rock. As we start our climb to the top of Chimney Rock, it’s important to note that while there is an elevator, it’s closed to the public for repairs at this time (July 2016). So the stairs, otherwise known as the Outcroppings Trail, is the way to go. And honestly, the Outcroppings Trail is the way to go anyway, because there are some truly amazing views of Hickory Nut Gorge along the way. While ascending (and descending) 315 feet, you really get a sense of the majesty of the area. It feels like every time you take a break — there are places to rest every 12 feet should you need it — the landscape changes and there is a new view to behold. 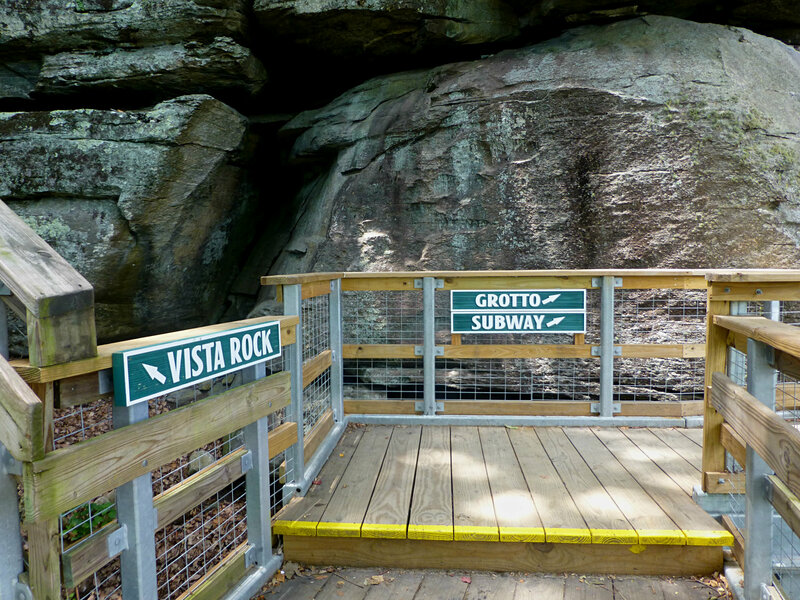 And to add variety, the Outcroppings Trail also offers the options of checking out the Birdhouse to learn about the different birds in the area, viewing an educational display on bats, and going into the very cool (figuratively and literally) Gneiss Cave, which is named for the Henderson Gneiss, the type of granite in the area. You can also bypass some of the stairs on the way up or down and walking/crawling through the “Subway”, a tunnel through large boulders and you can also hang out in the Grotto, created when a joint developed in the gneiss and broke off part of the rock. 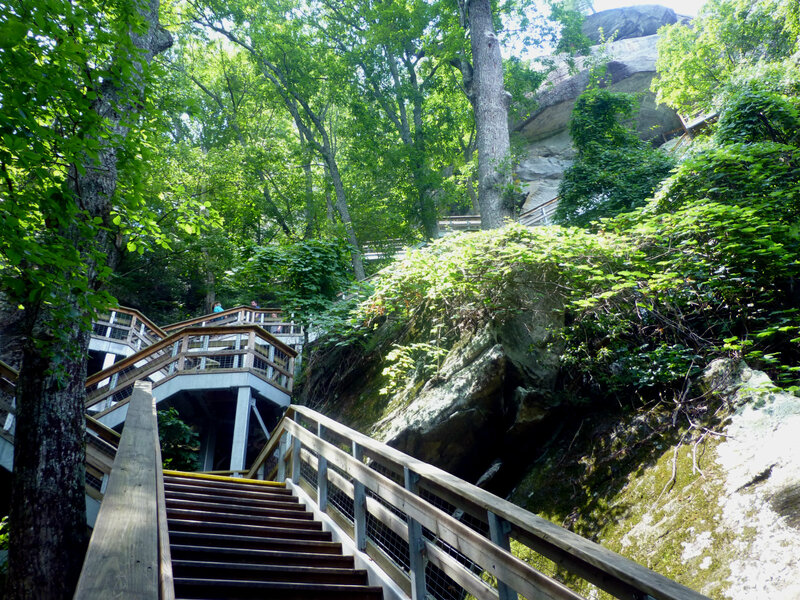 Before you know it, you’ll be right there under Chimney Rock and it’s just a few more stairs to the top! We especially love the following photo because the little tree on the rock seems to be cheering everyone on to the top. Made it to the top! This view is very much worth the climb. 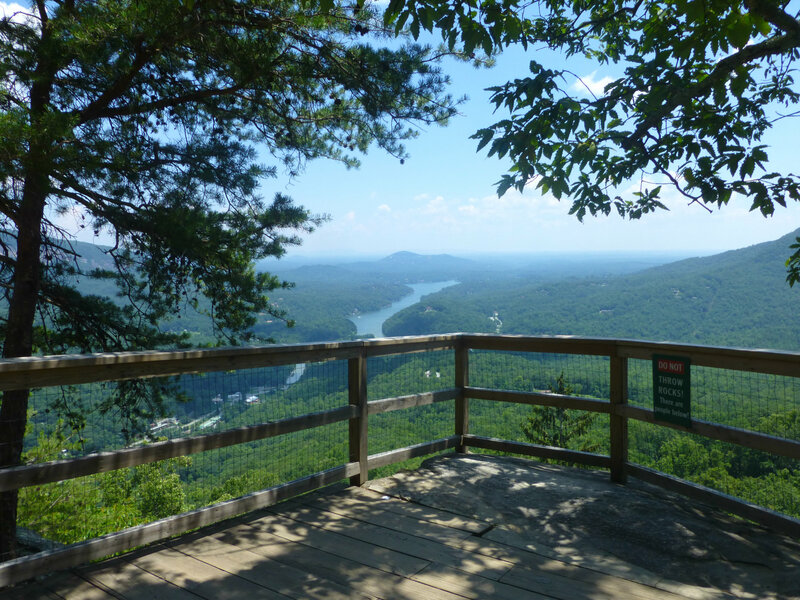 Stay a few minutes at the top of Chimney Rock admiring the expansive views of Hickory Nut Gorge and you’ll be ready to begin the journey back down. 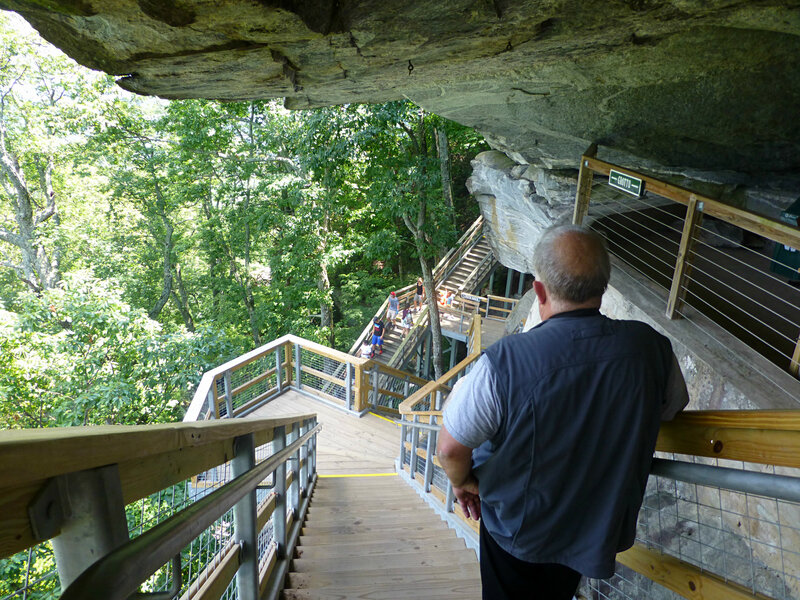 The view of the stairs from Chimney Rock. Well-constructed, the Outcroppings Trail is a great improvement to the park! For more info on Chimney Rock, located about 30 miles south of Inn on Mill Creek, visit www.chimneyrockpark.com. This entry was posted in Hiking and Waterfall Trails and tagged festivals and special events, hiking, outdoors, Summer by Inn on Mill Creek. Bookmark the permalink.